Well, the rush mechanic is coming soon, so one can dream about this card being unnerfed to the previous version, except instead of charge it would give rush. It would make patron warrior great again. It could just have charge itself in addition to it's text. It's a bit annoying when Blizzard can't see they over nerfed something to the point it NEVER sees play. Making it at least decent for new players is the main goal for me. I think a reasonable buff to this card would to give it +1/+1 (so a 3 mana 3/4), your charge minions have +1 attack, and your taunt minions have +1 health. blizzard could make this card at least slightly better if it didn't cost 3 mana but 2 instead. still, I think, that no matter the card's cost, the effect it has just won't justify having it in any warrior deck. they could also give the card its' original effect (or a similar one at least), but make the card cost 5 mana instead of 3 and have 3 attack and 4 health, so it could work kind of like a lower health, higher attack tundra rhino. It's be nice if blizzard changed this to "Whenever you summon a minion with 3 or less attack, give it Charge and Can't attack Heroes this turn." Any card with the charge is a useless trash if it cannot attack face when summoned. That's the one and only purpose of a charge mechanic. Charged Devilsaur, one of the best minions in Arena. This card should just give charge to minions that cost 2 or less. "Whenever you summon a minion with 3 or less attack, give it charge"
"Your minions that have 3 or less attack have charge"
This way when Warriors buffed their Frothing Berserker, or gave Grim Patron Inner Rage, it would lose charge as they'd have more than 3 attack. 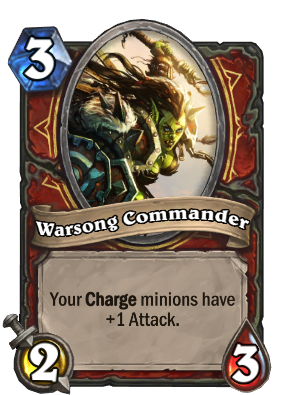 However Warsong would still synergise well with Grim Patron and be a good card in warrior, while eliminating the OTK. This should cost 2 mana for its stats and effect right now, or be a 3/3 at least. totally agree with you, when you see the mech warper with the same stats costing only two mana for a better effect, I don't understand what blizzard hab in mind for this nerf.